Reel Bride! 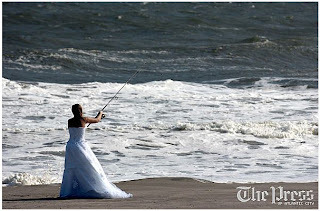 Yes, we could not resist this AP Wire photo this morning showing Daria Canale, of Huntington Valley, PA, fishing after her wedding in Ocean City, N.J. this past Wednesday. It reminds us that once all the ceremonies and toasts, and tears and laughter are finished, there still remains a question of: "When do we get to go fishing?"